Youth are invited to showcase their communication skills and share your knowledge in four styles of communication: Speaking, Puppetry, Demonstrations and Illustrated Talks. As a pre-fair event, the Communication Contest is open to all youth members of recognized youth organizations in Lincoln County between kindergarten and 13th grade (one year out of high school and not to extend beyond the age of 19). 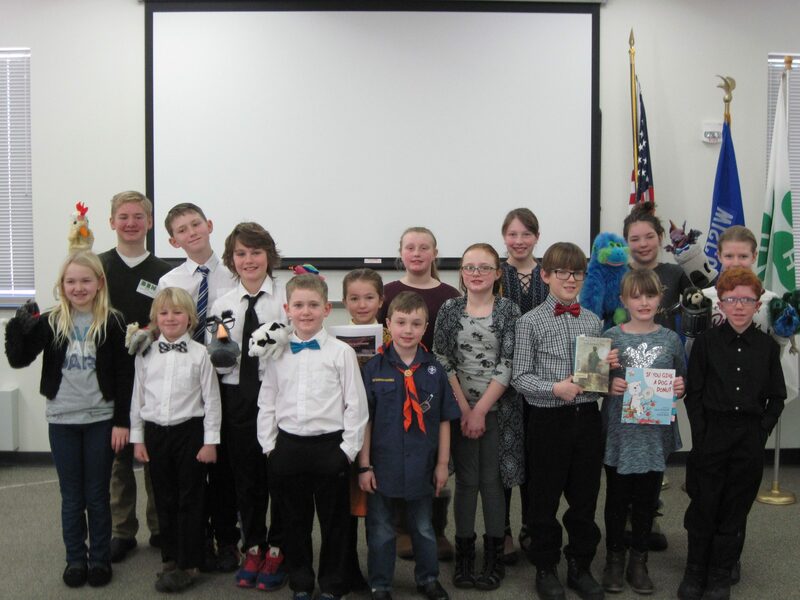 The 2018 Communication Contest was held on Saturday, February 10th. Thank you to Peter and Maxine Schuetze served as coordinators; Nancy Herbison served as the judge; and Ben Freyer and Lily Cordova, 4-H Ambassadors served as the emcee for the contest. Congratulations to all of our participants. For all county activities, groups may consist of any combination of enrolled 4-H members. Use good judgment on your entry selection. Parents/leaders are asked to preview performances to make sure appropriate for all ages of youth. Profanity is prohibited. Videotaping/recording of your child’s group performance for personal use is allowed. Videotaping/recording of entries as your submission for any county contest (Drama, Lip Sync and Music Festival, Communications Contest) will not be allowed. Performances must be live. The 4-H Board of Directors made the decision on March 23, 2013 for all county events, awards will be given out at the end of the event. If participants need to leave the event before the awards are presented, their awards will be mailed or distributed to them at a later date. 2. The same entry may not have been presented in a previous 4-H competition. 3. Participants may choose to use a podium. 4. An exhibitor should be enrolled in the project in which they are giving their presentation or have carried the project in previous years. 5. Certificates of participation and ribbons will be awarded. Judging for Junior, Intermediate and Senior Divisions will be done on the Danish system with county fair premiums being awarded. Please be sure to include entries on fair entry form (see Fair Exhibitor Handbook – Department 18 or 31 for complete listing). Participants are required to present their entry at the County Fair in order to receive their premium. 6. Each entry will be judged/critiqued (oral and written), except Cloverbuds who will receive participation ribbon (not judged or part of the county fair). 7. Classes and premiums are as per county fair exhibitor handbook. Refer to this for additional requirements. 8. Participants are required to participate in the Communications Contest exhibit at the County Fair or they will not receive their premium. This exhibit is usually held on Saturday afternoon at the Fair. 9. If you use props that create a mess (i.e. straw, hay, etc. ), try to wrap them in something and ask coordinator of the event for equipment to clean up after yourself. This will help everyone involved. Average grade of group will be used to determine division. All group members will read from a script. Entry should not be from a play script. 2. The entries in “Original Speech” must be original and developed by the youth. Adults may assist. Original Speech – original material written by the speaker on any topic, may use notes. Reading of Prose – includes narratives and original and non-original stories; may use notes or books. 4. No visual aids or charts allowed for any category. 6. The top entry in each grade division may receive a Best of Show ribbon at the judge’s discretion. 7. Outstanding puppetry and speaking entries by members of any age may be eligible to attend the Wisconsin State Fair for one day of performances at judge’s discretion. A chaperon is required to attend State Fair for the performance day. To be considered for nomination for Wisconsin State Fair, you must indicate you are interested on your entry form. 2. Stage/puppets/props–must supply your own–example: card board box, table cloth, chair, etc.–may be homemade or bought. Microphone will be provided. 3. Script may be original or published. 4. Puppetry is different from lip sync performances. In puppetry, participants must speak / sing the actual words. 5. Will be judged on creativity and appeal. 6. Each performance is critiqued/judged (oral and written), except individual Cloverbuds or groups where the average age is Cloverbud age who will receive a participation ribbon (not judged or part of the county fair). 7. Puppets may be used in more than one performance by different people. 8. Participants may participate in one group performance and one other performance, but may only enter one in the county fair. 9. Best of Show ribbon may be given to top performance at judge’s discretion. 10. Outstanding puppetry and speaking entries by members of any age may be eligible to attend the Wisconsin State Fair for one day of performances at judge’s discretion. A chaperon is required to attend State Fair for the performance day. To be considered for nomination for Wisconsin State Fair, you must indicate you are interested on your entry form. 2. Any exhibitor may give more than one demonstration and/or illustrated talk, but only one in any given premium number. 3. Demonstration is showing your audience how to do something with numerous props (i.e. demonstrating how to make microwave brownies, silly putty, etc.) An Illustrated Talk is use of limited props (a poster, model or graph) to help illustrate a talk. 5. Best of Show ribbon may be given at judge’s discretion to the outstanding entry. 6. Outstanding demonstrations by members 6th grade or older may be eligible to attend the Wisconsin State Fair at judge’s discretion. A chaperon is required to attend State Fair with the delegate. To be considered for nomination for Wisconsin State Fair, you must indicate you are interested on your entry form.